Small Stories reveals the fascinating tales behind some of London’s Victoria & Albert Museum of Childhood’s best-loved dollhouses, taking you on a journey through the history of the home, everyday lives, and changing family relationships. The exhibition is traveling worldwide with an exclusive U.S. engagement at the National Building Museum. The homes show developments in architecture and design, encompassing country mansions, the Georgian town house, suburban villas, newly-built council estates, and high-rise apartments. Many of the houses, their furniture and dolls have been specially conserved for the exhibition, with around 1,900 objects being restored over two years in the V&A Museum’s conservation department. During the 17th century, dollhouses were rare, expensive, and handmade by skilled craftsmen often to replicate real residences. Similar to cabinets of curiosities, they were often commissioned by men to demonstrate wealth and status of their households. Some were also used as learning aids for young girls and servants to become acquainted with their household roles. As with real houses, dollhouses have often been redecorated to reflect either contemporary tastes or those of a different age or time period. 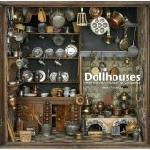 Dollhouses slowly developed into toys specifically made for children to collect, decorate, and play with. The industrial revolution opened up the possibility of mass manufacture and houses became a more common and affordable toy for many children. The Dream House installation is the finale of the exhibition, featuring a variety of imaginative and finely crafted rooms by American artists, designers, and architects. These twenty four unique rooms were commissioned by the Museum to showcase a diverse array of perspectives, demonstrating the limitless creativity of building in miniature. Visitors will see designs that are instantly familiar, completely fanciful, and even slightly eerie. Some were made using traditional furnishings, others from materials such as clay, insects, 3D-printing, and even Peeps marshmallow candies! Small Stories: At Home in a Dollhouse is organized by the Victoria and Albert Museum of Childhood with generous support from STUDIOS Architecture, the Milton and Dorothy Sarnoff Raymond Foundation, British Council USA, and The Frist Foundation. Additional support provided by Farrow & Ball, XL Catlin, and Henry and Jessica Townsend.